Heavenly Valley sits right in the middle of all the action. The dividing line between California and Nevada goes right down the middle of the lake and extends all the way through South Lake Tahoe, Heavenly Valley Mountain resort and the ski area. So South Lake Tahoe is both in California and Nevada. The larger hotels with casinos and showrooms are in Stateline Nevada a funny name for that part of South Lake Tahoe, and the hotels on the California side which won't have casinos are in the actual town of South Lake Tahoe. 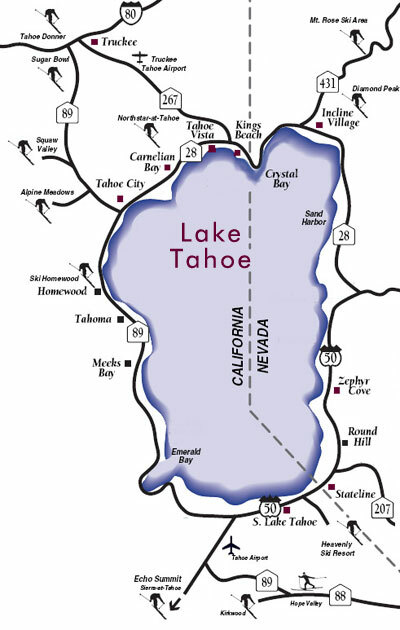 There isn't really a city called South Lake Tahoe in Nevada, we just call the whole area including Stateline by that name for ease...! There are also lakefront hotels in Tahoe, and some very nice quaint boutique hotels that have their own access to the beach. Perfect if you don't want to be noticed! Each hotel is rated by the hotel industry national standards but take it from us, the larger hotels have more services such as room service, lobby bars and restaurants, and the smaller boutiques will have gorgeous furnishings, but only mini bars and minimal food service. You will get friendly attention from both with a dash more from the boutique hotels as they are just smaller. When you come visiting on a longer trip or with a bigger family, you will find that South Lake Tahoe vacation rentals will be a very smart thing to do. You'll find beautiful vacation rentals lakefront, in the hills with views, or near the action.